"All for one, and one for all!" The King's personal bodyguard stands ready to defend his sovereign. Media: Head, hands and feet of Super Sculpey, on a wire armature, with a cloth body. He has curly brown mohair protruding form under his black hat with blue plumes. He wears brown leather boots with gold buckle, and black pants. 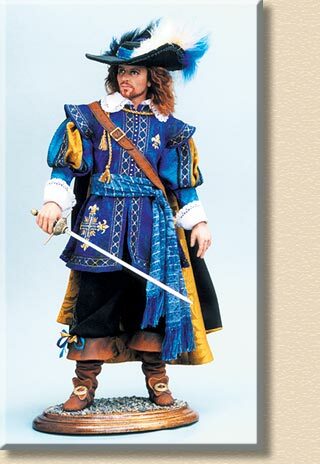 His tunic is blue brocade with blue and gold trim, and a gold and silver cross painted and embroidered on one side. He has gold and blue puffed upper sleeves, and blue lower sleeves with a large white laced cuff. He has a large lace-edged white collar. His cloak is black, lined with gold brocade. He has a blue fringed sash, and a leather belt with scabbard. he holds a handmade sword in his right hand.